After a 15 minute easy warm-up, keep an effort that is easy but not trivial. You should feel that you are applying some pressure to the pedals, but definitely not be going hard enough to increase your breathing rate or depth, or to feel any 'heat' in your legs. Make the total exercise time at least 1-1/2 to 2-1/2 hours, including warm up and cool down. Keep your cadence in the range of 90-110 rpm. If you can't comfortably maintain over 90 rpm, use one gear easier than the most comfortable gear. For this active recovery ride, think “coffee shop ride,” or “cruising along the beach ride,” where the idea is to get the legs turning over, but have no work required. Just enjoy the ride without breaking a sweat, to allow quicker recovery from your previous workouts and get you prepped for the workouts ahead. After a 15 minute easy warm-up, keep an effort that is easy but not trivial. You should feel that you are applying some pressure to the pedals, but definitely not be going hard enough to increase your breathing rate or depth, or to feel any 'heat' in your legs. Make the total exercise time 1 to 1-1/2 hours including warm up and cool down. Choose a hilly route. Strictly obey the intensity limits. Spin on the flats and mild downhill’s at 90-110 rpm, or as high a cadence as you can sustain with smooth power if that is less than 90 rpm. Stand for the duration of all the climbs up to five minutes. On longer climbs, sit for the beginning and stand when you have about five minutes of climbing left. When standing, keep a cadence of 65-75 rpm while maintaining the effort that is easy without feeling any burning in your legs. Reduce your cadence as needed to keep you heart rate from exceeding the target zone. If you can’t stand in zone for a full five minutes, start by standing one minute less than as long as you can and add one minute per week. (So if you can comfortably stand for about 3 minutes, you might start by standing for 2 minutes per interval the first week, three the second and so on). Get at least fifteen minutes of standing in each ride. If you can’t keep your heart rate down you’ll have to go slower or get an easier gear. After a 15 minute easy warm-up, keep an effort that is easy but not trivial. You should feel that you are applying some pressure to the pedals, but definitely not be going hard enough to increase your breathing rate or depth, or to feel any 'heat' in your legs. Make the total exercise time at least 1-1/2 to 2-1/2 hours including warm up and cool down. Spin a comfortable cadence while warming up and cooling down. During the main workout, keep your cadence over but near 70 rpm. We want to see your cycle challenge updates! Upload your photos to social, tag @raleighbicycles and use the hashtag #howiraleigh! With over 20 years of experience in cycling, Jenni Gaertner of Wenzel Coaching has an extensive knowledge of the sport as well as the unique demands it places on the body and mind. A fascination of the science of sport human physiology led her to earn a Bachelor's degree in Health and Human Performance from the University of Montana and a Master's degree in Physical Therapy from Idaho State University. She also holds a Master's degree in Education and certifications in Medical Massage and Infant Massage. This is health advice from fitness professional, Jenni Gaertner, MPT, M.Ed. 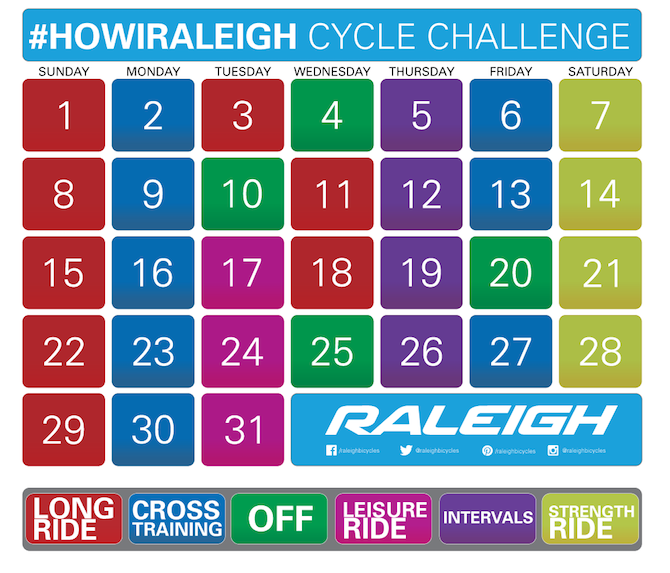 Raleigh Bicycles cannot be held responsible for any injuries which you may get from performing any exercise listed on this cycle challenge calendar. We advise you do not take up these challenge if you have any medical condition, are suffering from back or neck pain or any injury or are pregnant. The workout recommendations listed on this calendar should be treated as a guide only and are not to be taken as 100% the best way to train. We want you to have fun with the cycle challenge and we hope you get fit, get in shape and see benefits from completing them. Remember to stretch before and after exercise to avoid injuries.